For years now I've been an enthusiastic reader of the Nobel Prize winning US economist and New York Times columnist Paul Krugman. For so many reasons this guy is one of my all-time heroes! He's the scourge of the wingnut Republican conservatives in the US, particularly the neocons of recent times. He gives no quarter and lets them get away with nothing. What makes him so powerful are two very formidable talents: the lucidity of his writing, and his exquisite intelligence. Virtually singlehandedly he brought an end to Bush's crazy push to privatise social security in his second term, a proposal that would have savaged the entitlements and savings of tens of millions of Americans, but that was being sold as a way of rescuing funds from the dead hand of government bureaucracy so as to generate higher levels of returns on the market for individual citizens. Krugman's relentless and forensic critique of the proposal eventually sank it. Imagine the state those privatised funds would be in now after the financial crisis. Krugman has written a number of books, but the latest and possibly best is The Conscience of a Liberal. There could be no better introduction to American politics and society than this magnificent and engrossing tome. The chapter on the rotten US health system and why it so desperately needs wholesale reform is one of the best things you could ever read on the subject. But for a shorter intro to how good this guy is read his recent article in the New York Times called How Did Economists Get It So Wrong? 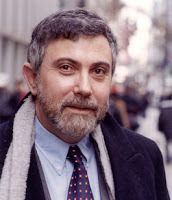 Krugman got his Nobel Prize for his seminal work on trade theory. He challenged the long held belief that countries traded with one another because of the notion of 'comparative advantage'. Country A is good at making cheese and Country B isn't, so B imports the cheese it needs from A and sells stuff it's good at making to A in return. (Australia sells coal to China and buys cheap manufactured goods from China). But, wait a minute...how about all those countries in Europe who make cars and import them as well? Italy, Germany, France and Sweden all export and import cars at the same time. So in fact does Australia, not to mention the US. Krugman blew the notion of comparative advantage right away. He looked at what was actually happening in the real world and then tried to construct a theory around it, rather than the reverse. Countries export as a way of reaching out to new markets, as a way of growing. And they import what they need and whatever takes their fancy. This bias towards real world immersion is what has made Krugman such a compelling commentator on the current global financial crisis. He is a strong supporter of the stimulus packages implemented by so many governments around the world (in fact he considers they didn't go far enough) and a fierce denouncer of the 'debt is bad' mantra of wooden-headed conservatives. Reading Krugman is a tonic, simply invigorating. His columns appear twice a week in the New York Times. I urge you to indulge! Before the US election, I joined a Facebook group called 'Paul Krugman For President'. I stand by that idea. Genius.